We have decided to post our news in future on Facebook, where you will have the opportunity to “Like” and “Share” our posts with your friends. Pick & Mix your Veg! Sourced predominately from Cuttlefords Veg Farm near Congleton or, if they don’t grow it elsewhere in the UK. Cuttlefords vegetables are incredibly fresh, having often been in the ground until a day or two before you receive your order. Please help us support Cheshire vegetables and buy as much of your weekly veg from us – if you continue to spend a minimum of £5 on veg each week, it should work fine. If it proves very popular, we should be able to bring our prices down, but even as they are, we are very competitive with local supermarkets and can beat them on freshness every time! At the end of January we were able to join in at the ‘Random Apple Company’s Wassailing’ Event in Swanscoe. We currently supply some of their delicious seasonal Elderflower Cordial and Preserves. They produce their own Random Apple Juice from their orchards and welcome donations of local apples in return for bottles of pasteurised juice. The event included Morris Dancers, bonfire, singing and ‘blessing’ the apple orchard for next season’s yield. We hung bread on the branches and ended the evening with a fantastic shared buffet and hot mulled ‘Random’ apple juice. The pheasant and chestnut casserole was superb. Dressing up was optional but as you can see a great effort was made by some to enjoy the theme! Despite the rain we all had a great time. Many thanks to Sarah for the invite. Thanks to all who turned out despite the weather to meet our baker Ruth and pie-man Mark! It was great to meet so many of you and hope you enjoyed the chance to meet the faces behind your produce! A particularly big thanks to Ruth from Langley Loaves and Mark from Treacle Town Pies for their support and delicious samples! Spread the Word & Get Free Veg! To encourage you to spread the word about Food4MAccDirect to your friends, neighbours, colleagues and family we’re bringing back our popular ‘recommend a friend campaign’ for the month of October. 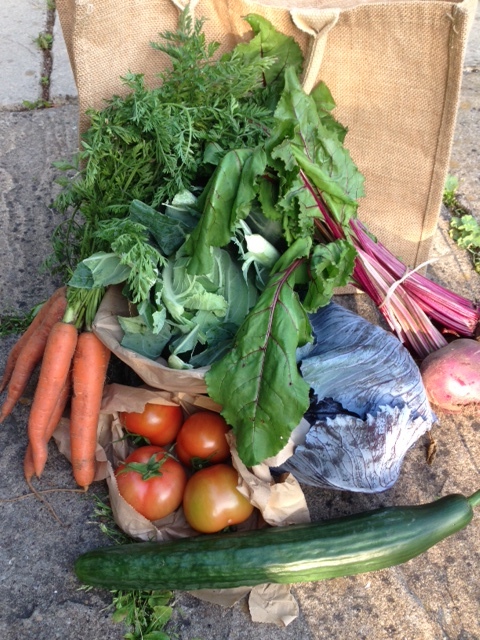 For every new customer that you introduce this month (who places an order the same week as you) you’ll receive a small veg bag – completely free.